Thrift Stores: Not your grandmother's version any more! Not-for-profit shops nowadays can be large or small, focused or generalists. Shoppers seeking exceptional bargains love NFP stores because the unusual, the exceptional, and the just-plain BUYS are often found here, thanks to operating costs kept low with careful budgeting and cherished volunteers. And it used to be that non-profit thrift stores sold used merchandise that was donated only. No more! Now, some thrift shops accept consignments, some buy wholesale to fulfill a need in their marketplace, and some solicit brand-new merchandise from manufacturers and retailers. The same... but different. Some thrift store staff feel that their issues are not the same as for-profit resalers. While sometimes this is true, you can still learn a lot from your for-profit peers. Follow our blog, our Facebook and Pinterest accounts. Don't have as much time as you'd like? Zero in on our blog posts tagged "thrift." Send this page to a coworker, your Board of Directors, or the shop down the road. 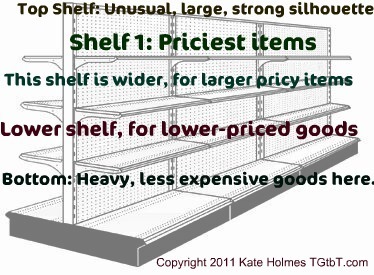 Gondolas, the multi-tiered shelving units used in many thrifts to display household items, can actually focus shoppers' attention. Here's an illustration I created for a thrift to help their volunteers place incoming for maximum sales. Feel free to use this in your Volunteer Manual in your NFP thrift store! No time to think up posts that will get shared? Blog entries to polish your shop's image? Too Good to be Threw has created share-able articles, blog posts, and Pins for your free use! 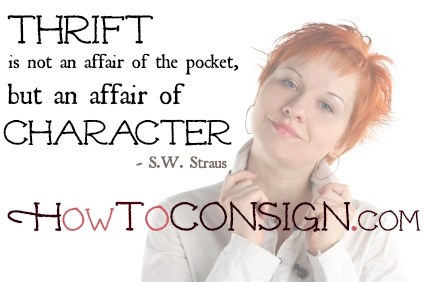 HowToConsign has customer-oriented articles and our consumer blog has timely posts. HTC on Facebook and on Pinterest. Most of our Products for the Professional Resaler are delivered to you via email as PDFs, so you can get your Products Pretty Darn Quick and put your new knowledge to use today! 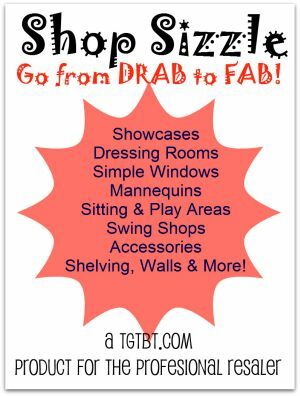 TGtbT's Product for the Professional Resaler, Shop Sizzle, is 64 pages of inexpensive ideas to spruce up your shop with little or no money. Get it here. Many thrift stores have volunteers with talents, but who cannot work on the sales floor. These wonderful folks can put their talents to use increasing the value of your donations! On our TGtbT Pinterest board for shopkeepers, we've collected up saleable projects. Lots of these ideas would also make a fun Volunteers' Social Evening in the shop, where volunteers can socialize as they create. Highlight hidden attributes: Is that a sleeper sofa? Do you have 6 of those bar stools available? Create branded signage, laminate, and use over and over again to tempt shoppers into investigating a little bit closer!